So you know the three essential, but ultimately simple, skills for feeding your pet birds – chop, grain bakes, and sprouts. You feed a pellet base (or maybe not, depending on your views), and save the seeds and nuts for much-loved treats. Fresh vegetables and fruits make up the main part of the diet – but, your bird won’t touch any of it. This is the post for those of you whose birds won’t eat – or even hate – fruits and vegetables, or for anyone who wishes to expand their pets’ diets. Got a bird who will only eat seed? We can fix that. Getting any picky parrot to actually eat anything it doesn’t recognise as food is the true challenge; offering your flock wholesome, nutritious varieties is only half the battle. 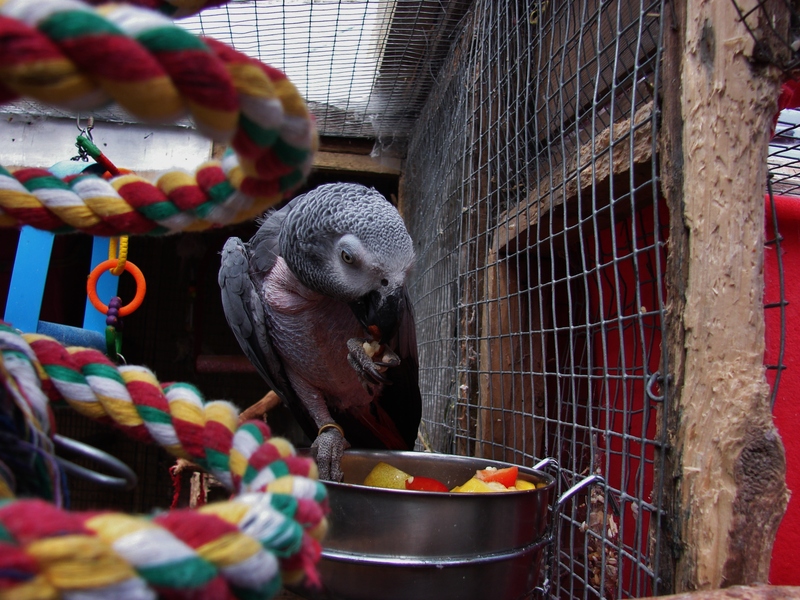 I have had great success with the following – so I decided to make my own ‘top tips’ article for those who are struggling to improved their parrots’ diets and get them to eat healthy foods. You can try all of these tips, just one, or any in combination. Just remember that persistence is key. Feeding your bird an all-seed, pellet, or nut diet is massively detrimental to its health. A parrot may look okay on the outside, but imagine what its insides might look like! Not good. It’s like feeding your infant a diet of Irn Bru, or Pepsi, or your toddler three square meals of chocolate and crisps. A bird isn’t going to want anything else when it knows you’ll eventually offer it the junk. 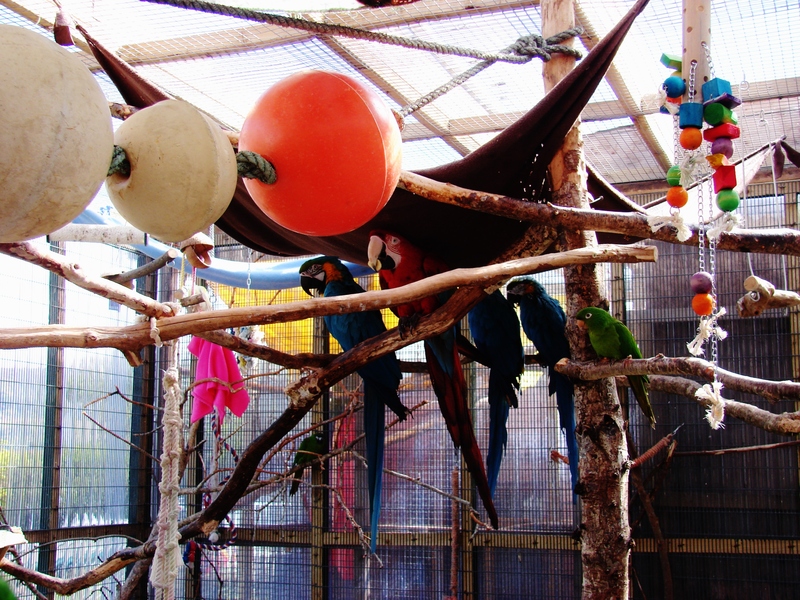 Our birds need plenty of fresh fruits and vegetables (and more). 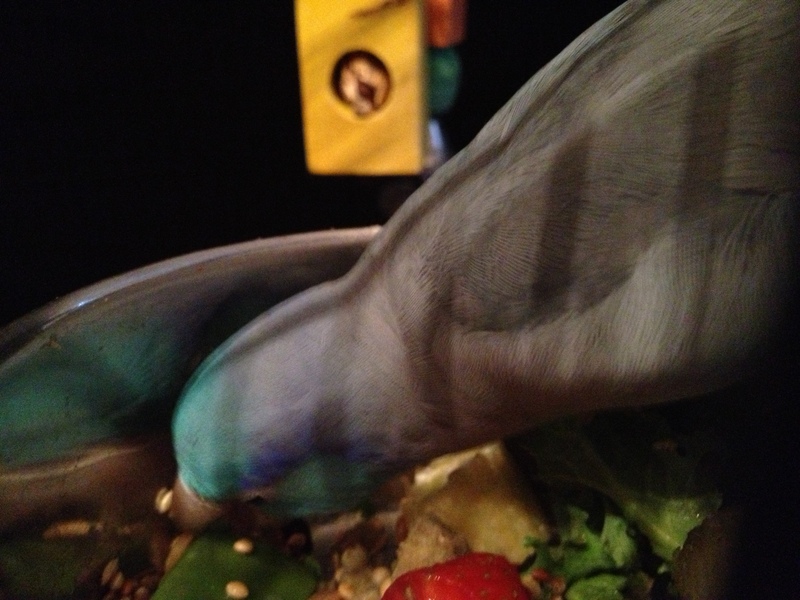 This picky parrotlet has a weakness for fresh fruit. 1. Shake it up. Try chopped, whole, sliced, diced, shredded, mixed, mashed, skewered, etc. Never serve the same way twice in a row – and remember, you can combine these. 2. Show him it’s yummy. Arrange his meals so they coincide with the human’s. Besides being a flock behaviour, your bird will see you eating it and want some too. You can even share right off your plate, if that works, so long as it’s healthy and salt-free. Try making a huge deal out of what you’re eating. He needs to see you really enjoy it. 3. Fresh food in the morning. Try offering fresh fruit and veg right away in the morning, when your bird is most hungry. 4. Don’t leave food in the cage. Take it out and try again later if your parrot isn’t eating. Make sure fresh food only stays in two or three hours, for maximum freshness. If you wouldn’t eat it (or serve it to your kids), your bird shouldn’t either. Don’t leave food in overnight. 5. Mix in a drop of fruit juice. Drizzle some organic fruit juice – like orange, or mango – over his meals. Just a little will do! 6. Sprinkle his usual food in/over the new diet. This shows him it’s edible. He’ll also have no choice but to dig through the fresh stuff to get to his favourite bits. 7. Serve it warm. Warm food is closest to what they’d find in nature, and usually they find it very comforting! Make sure it’s comfortable for you to touch, or he could get crop burn, though. Most parrots will accept warm food over cold any day. 8. Serve in the sunlight, or under a UV lamp. This was a biggie for us. Birds see in UV, so without the sun, their worlds look rather dull and grey. Putting him in the sunlight lets him view his food in a much more appetising way. 9. Use known favourites in his new meals. Since Ptak likes strawberry, I’m going to serve him birdie bread with some mashed in and on top. Be clever and sneak new things in with old favourites. 10. Save the ‘junk food’ for treats. If your pet loves sunflower seeds, or anything else similarly unhealthy (for example, nuts), remove them from his diet and use them as bribes and rewards. This makes them extra valuable to your bird. 11. Let him watch other birds eat. This only works if you have other birds in your home, but it can convince any picky eater that a food is safe. 12. Play keep-away. Pretend you don’t want your bird to have some, as if you have a plate of salty chips instead of a salad. Make a big deal of how delicious your food is. Works like a charm. 13. Ensure your bird isn’t starving. Check with your vet to see exactly how much of its ‘regular’ food you should be feeding each day – as the goal is not to starve your pet. This will be a specific, measured amount, such as a teaspoon of seed a day. The truth is, birds who have survived on bad diets won’t recognise the fresh, wholesome stuff as food, so you’re going to have to work hard to convince them otherwise. 14. Be consistent and persevere! Even when things don’t progress smoothly, don’t give in to the temptation to return to old habits. This process can take days, weeks, months – or longer. It’s worth it in the end, as your bird will bite, pluck, or scream less (undernourishment causes behavioural issues), feel better, and live longer. You can do it! 15. Use new places and situations to your advantage. Try serving a meal in a different cage, in a new room, or a new place entirely. This can be enough to convince many birds to taste things, especially if they think they’re getting away with eating something that isn’t theirs. Birds eat when they feel comfortable. Usually, they use their left feet to grip and manoeuvre items. Any ideas? He is used to eatting treats like sweet potatoes with butter, now without butter, he won’t eat. I’m sick as I work and travel a lot and have my pet sitter take care of him. I have to find a nutritional way for him to eat on his own. Terrible dilemma. Stubborn bird! This is a really helpful article. Thanks for the advice. I just got a baby lovebird and she is such a sook. She is weaned but after I took her home I think the new environment caused her to regress in her development a little and now she mostly wants hand feeding formula. After a few days now I’ve been able to hand feed her seeds and pellets, and I got her to try dates, but I think it’s going to be a while before she is fully eating on her own. I’ll try some of these methods. I think maybe mashing up the fruit/veg will work, and heating it up. Also eating it in front of her and then sharing it.